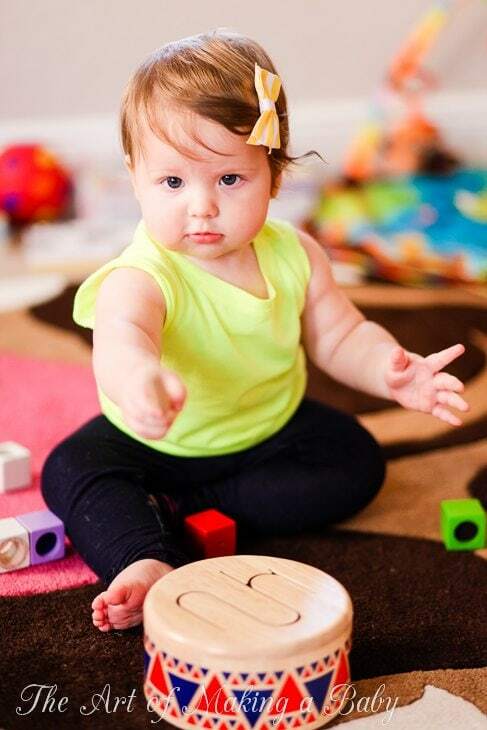 What company comes to mind when you think of all wooden toys? For me, it’s PLAN TOYS! Green company, green materials, green manufacturing. Get this! They even skip the fertilizer three years before the rubberwood trees are cut to make the toys. How cool is that? Formaldehyde-free glue, water-based paint without heavy metals including lead and lots of wood wood wood. Before I got into this whole “mommy business” I thought wooden toys were for babies. 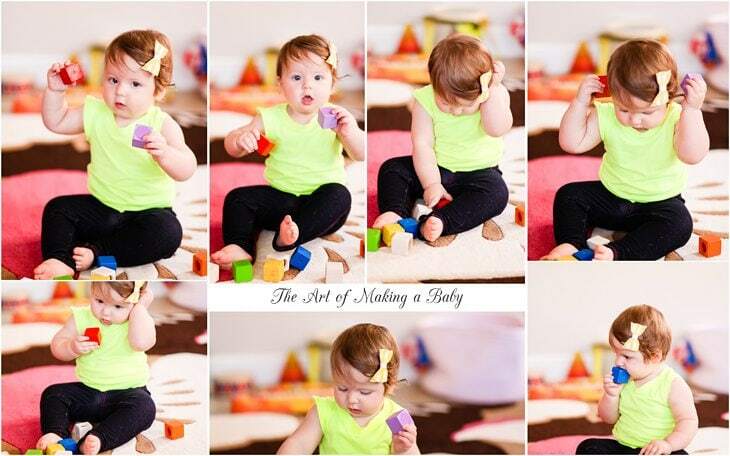 Small teethers and blocks cut out of wood. Simple toys. But you can make so much more out of wood than just things to teethe on. 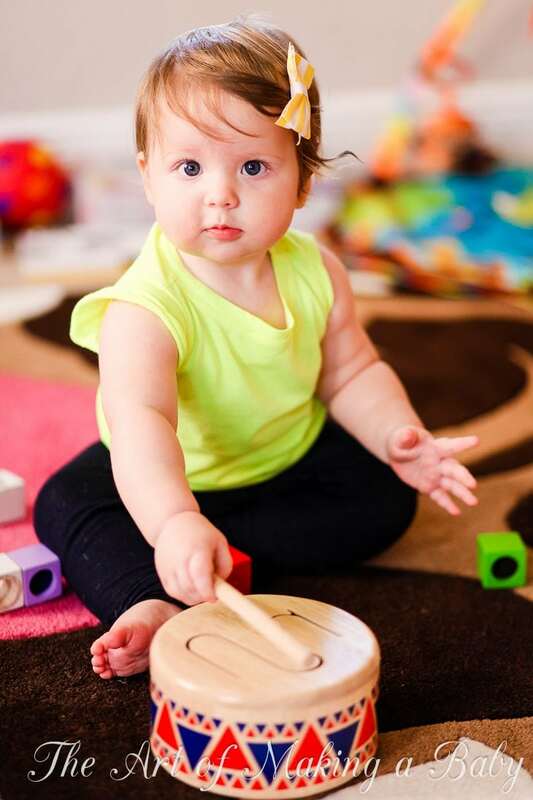 PLAN TOYS spans the whole childhood: age 0 to 100 ( hey, some adults are just big kids). We had more simple toys to play with. At first I thought that these toys would be simple enough that you can get them from any company and pretty much get the same thing. It wasn’t until I sat down to write this review that I realized how unusual every item we got was. 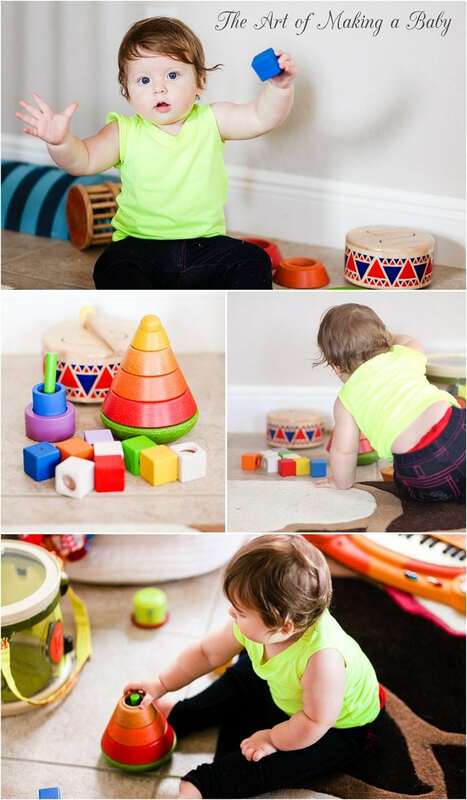 These weren’t just blocks, a drum and a cone sorting. This drum however is divided into three parts with each giving you a slightly different sound. Maybe not anything a baby would notice, but give it a toddler and he/she will quickly realize that there’s music to be made on it. I love that pattern too. It looked perfect in our Christmas photos 🙂 Up until now, Lexi has been obsessed with the drumstick, but the day of these photos she actually started mimicking us and banging with it on the drum. It was so insanely adorable! 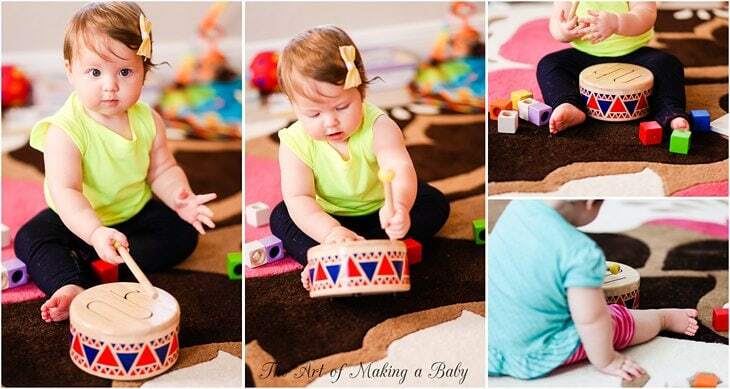 I’ve got a future drummer growing! Not so simple. Each block has a feature: a suncatcher or glass inside, some textured material, holes, a bell, a chime. Three auditory blocks, 3 textured blocks, 3 visual blocks, all in different colors, too. In the picture below you can see Alexis shaking the blocks to hear the chime in the red one ( she doesn’t realize the purple one doesn’t ring). Every day when we bring her into her playroom, she crawls over to the blocks picks up the red or the blue one and shakes them vigorously. This one is for a slightly older baby, but it does entertain Alexis in a different way. At first glance,it’s a simple cone like you see everywhere, but it contains additional sorting wooden shapes inside, which seem to be more appealing to Lexi even more than the actual cone. We can’t assemble the cone fully, before she rushes in to grab the top of it and pull it apart. It’s become a way of getting her attention. If she doesn’t want to crawl over to one of us, all you have to do is assemble the cone and as soon as she hears it and see it being put together, she speed crawls over to knock it down. Disclosure: Plan Toys sent us 3 toys to facilitate this review. All opinions are our own, as always. I think they have a factory in Thailand. Check out their about us page. My husband works for this company the are made in China and not as safe as one thinks. I just looked it up. Their factory is in Thailand, so no, they are not made in China. We have a few of these toys at home, and really love them! 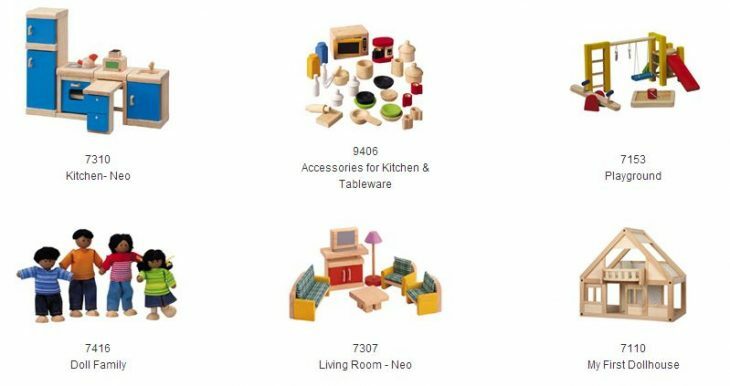 I’m all about wooden toys, and love finding brands that have such unique, fun items, but also are very eco-friendly. I love wooden toys! Thanks for sharing!! I’m sure if you email or call their corporate you can get that answer. I would imagine they are though. Ikea has the only non lead Xmas lights. I was just reading about them yesterday the topic was PVC and phthalates and the article had only positive things to say! Wooden toys are a nice alternative to the more common plastic toys. The pictures are beautiful as is your daughter. Love you reviews on toy safety. Although I try my best to avoid plastic toys and any kind of contact with ‘unsafe’ components, I cannot help but wonder about the ingredients in a mother’s cosmetics and to what extent are babies exposed to them on a daily basis. How much is too much? Any thoughts? Oh yeah! Make up is no good. I finally just recently managed to switch my main make up to at least stuff that is phthalate and paraben free. But make up is much tougher than just buying safer toys. I think that if we are talking about our babies being exposed to our personal products, what is important to switch is the foundation, lotions and creams and definitely perfume (those are full of nasty stuff). The rest in my opinion is negligible exposure.